Recognizing that she felt her happiest when working with cats, Dr. Nancy Dunkle founded Exclusively Cats Veterinary Hospital in 1994. Fulfilling a dream by establishing a cats-only practice allowed Dr. Dunkle to create a special environment dedicated to the care of felines and staffed by people who love cats. Rose, the resident hospital cat, strolls throughout the building, but her main duty is to “supervise” the staff so that patient care is up to “feline standards.” The waiting area and select exam rooms offer panoramic outdoor views. Kitties get to train their sights on all sorts of critters while cat parents enjoy the company of a helpful, cat-loving staff and browse our shop, which stocks the best in cat products and toys. Best of all, Mom or Dad knows that their special feline is in expert, caring hands. Cats truly are like no other species on earth and we recognize that at Exclusively Cats. Further, we also understand that each cat is unique and uniquely special to you. Our goal is to understand the needs and preferences of your cat, enhancing the veterinary care we provide. At exams we’ll take note of quirks, habits, handling preferences, and the like. Naturally attuned to cats, we bring this expertise to both the medical and the behavioral services we provide. Dr. Dunkle is a longstanding member of both the American Association of Feline Practitioners and the Cornell Feline Health Center. Committed to continuing education in feline veterinary medicine, Dr. Dunkle makes a point of attending annual symposia and other cat health conferences to learn the latest thinking and best practices in feline care. With more than 20 years of focusing on feline health, Dr. Dunkle is uncommonly qualified, as is her long-standing and dedicated staff of professionals. 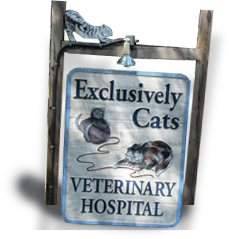 Exclusively Cats Veterinary Hospital prioritizes client education and customer service. During wellness exams, we will spend time talking with you in order to develop an individualized cat care plan. If your cat should fall ill, you will receive follow-up calls and ongoing advice on how to get your kitty feeling his or her best. We’ll even coach you on how to best care for your feline companion at home. Experts on cat behavior, we’ll explain why your cat may do this or that. We understand just how much a healthy and well-adjusted kitty adds to your home and life!